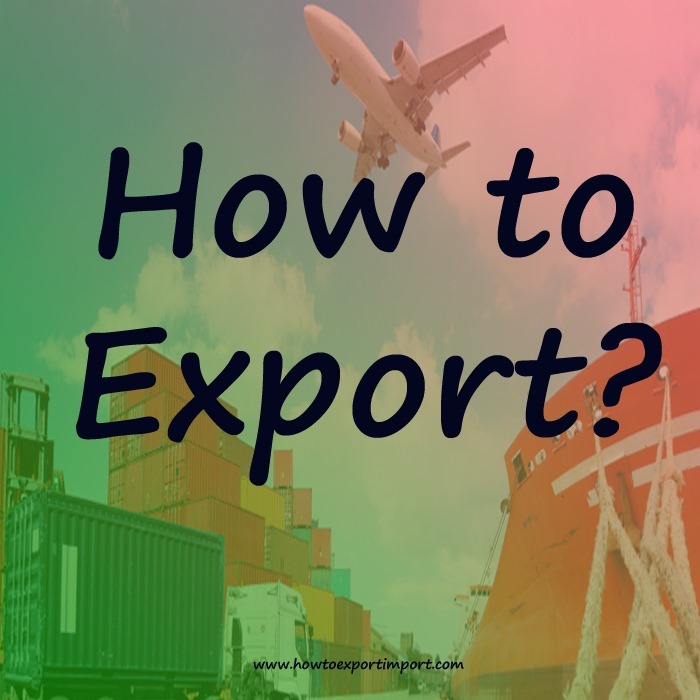 In this post, a basic idea about export procedures and formalities are explained. This export process is same in almost all countries with slight variation. 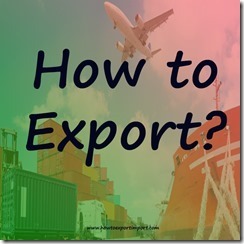 I hope this post helps you in getting a basic training on how to export various products. If you are an exporter, you would have already set up an Export company by following necessary government rules and regulations. By choosing your export product, you would have sent export samples to your international buyer if required and got approved. After necessary communication with your overseas buyer on terms of payment and terms of delivery, you arrange to issue proforma invoice, in turn you receive export order followed by purchase order from your overseas buyer. The terms of payment for your export contract could be advance payment, Documents against Acceptance DA, Documents against Payments DAP, or under Letter of Credit LC. If you as overseas seller require to cover credit risk against your overseas buyer, you can approach concerned authorities to cover insurance. In India, ECGC is the authorized agency who covers such credit risks for Indian exporters. Being an exporter, you will have an idea about other risks involved in export. The terms of delivery could be EX-Works, FOB, CFR, CIF, DAP, DDP or any other Inco terms. If you would like to arrange finance against export , you can approach your bank for preshipmentor post shipment finance against export orders obtained by you. If any international quality check agencies like SGS,BVQI etc. are involved as per the terms and conditions between you and your overseas buyer, such inspection is arranged. After completing necessary quality check (QC) formalities, the goods for export are arranged for proper packing to meet export quality. Palletization or Crating is arranged for safety of cargo. If your export goods are shipped by sea mode of transport, you decide whether the export shipment is by LCL or FCL. Necessary information about shipping of LCL may be collected if sent as LCL. Type of container is decided based on your nature of export goods. Ok, now the shipment is ready for export. The documentation department prepares export invoice, export packing list etc. based on the purchased order or LC. Application for certificate of origin (GSP – Generalized System of Preference) and other required documents required for importer are also prepared. Necessary documents required for export customs clearance purpose are forwarded to Customs broker. The export process at customs completes either by customs broker or your representative directly. You as an exporter decide whether your export shipment is FCL or LCL. Pre shipment inspections like Phyto sanitary, Fumigation etc. if required have to be completed before export of goods. Bill of Lading or AWB is issued by carrier of goods. If consolidator involved, HAWB or HBL is issued accordingly. If On Board Bill of Lading required as per buyer’s requirement, you have to wait to get the export shipment go ‘onboard’ the vessel. If you export your goods from a dry port, you have to wait till the cargo to go onboard the vessel, if you need On board bill of lading from shipping carrier. After completion of export customs clearance procedures and collection of AWB or Bill of Lading, necessary documents for bank and overseas buyer are prepared. The export bill can be disounted, arrange for collection of payment if on credit basis or negotiated if export shipment is on Letter of Credit basis. If you have availed packing credit from bank, the amount of discounted/negotiated export bill amount will be adjusted once bank receives export proceeds from your overseas buyer. If bank does not receive such export proceeds from your overseas buyer, your bank may crystalize such export bills, you/bank can approach credit insurance company (like ECGC in India) for claim, if such cover done by you or your bank. This article explains about exportation procedures to ship to overseas countries. The above exportation process is almost same in all countries. Have you satisfied with this information on different process to export goods? I hope, this article can enlighten you on basic idea on how to export goods from your country to other foreign countries. You can express your views on procedures and formalities to export goods to overseas. Share below your thoughts about this article, export procedures and documentation. Md Aslam: On 28 March 2015 Sir I want to start a business of export of leather hand bags wallets ets. How I cant start. I want help. Plz tell me the aactual procedure. TAPAN BANERJEE: On 11 May 2015 IF BUYER FAIL TO MAKE PAYMENT OF EXPORT BILL .... CAN WE MARK OFF THE BILL FROM EEFC ACCOUNT WITH OUR BANK AND RELEASE GR. manoj kumar: On 28 May 2015 Sir, I want to start export of silver articles ( silver utensils) from Delhi, I have applied for IEC code after code, what is the process and where we have to registered and what document required at the time of taking order and Billing process etc. OKOLIE CAJETAN. : On 11 June 2015 Hello,please what is the total weight of a 20 feet dry container without any good inside it? Secondly,can a 20 feet container with 295 numbers of used motor engines has a cbm of 30.00.and weight of 21140?I will come back here to tell you why I asked this question.Thank you. Prateek : On 23 July 2015 Sir I want to start a business of export of leather hand bags wallets etc. i have already got IEC .my operating base will be in Mumbai. I will be exporting goods to new zealand. please tell me the step by step procedure. is Inspection of leathers goods always necessary ? from where can i get my goods inspected ? your help is appreciated. Thank You. sandeep: On 07 August 2015 How to find out whether a particular item is allowed to be imported in the country where we want to export? MARIMUTHU: On 08 August 2015 Dear Sir We are going to export first time to North America USA any special proceedure / documents required please advise. we are manufacturing of Wiring Harness to Automotive sectors. baluchandran: On 24 August 2015 i want to export my ceramic products. i dnt knw where to start and approch. how to get orders. pls help me this. ramniwash: On 09 September 2015 sir/ Mam Wanted to do export business so i just wanted to know that how much % Tax will be charge on the CFL Dis Assemble goods Please let me know on the urgent basis. selvakumar. p: On 24 October 2015 I want some study materials about exporting business. Please let me know the website. Mr jasmin m jani: On 08 December 2015 There is exemption from IEC code for export of goods for personal use. If one has to offer and send single piece say necklace - as per inquiry with Him for personal use then how should he go ahead. How can he get money paid to him? Can it be received via western union money transfer as that Is cheap to personal use buyer. If it is continuous sales of such single items by person from different countries can he have more than 12 payments Received from same or different persons? ATRAZ: On 11 December 2015 we are exporting on FOB payment term.the importer ( our customer )'s forwarding agent wants to charge us a fee for the AWB ( AIRWAYBILL ) document.Is this correct ? Shouldn't the importer pay for it,if such a fee exist ? Tushar BHalke: On 15 December 2015 Dear Sir, My company was newly started Export Business. The product is Pipe & Fitting. Now i want know the procedure for close the Drawback in DGFT. please find below queries are: 1) if Shipping bill / EP Copy mentioned draw back rate. then which procedure i will follow. 2) which documents are required to submitted to DGFT. please i suggest me how can i do this is to be earlier..
surya: On 19 January 2016 sir, i wish to export Art paintings, how to search buyers/getting orders. pls help me. Ravi solanki: On 29 January 2016 how can i export the stone article ..? Pratik: On 23 February 2016 Is is possible to export brass electrical products to Finland (Buyer Location) if the P.O. is from a middle party based in Bangalore? Rahul Vilas Kadam: On 21 March 2016 Sir I want to start a business of export of agriture product etc. How I cant start. I want help. Plz tell me the actual procedure. Thanks in advance. KARTIK CHANDRA BEHERA: On 26 March 2016 SIR I WANT TO EXPORT SABAI GRASS ROOP AND SABAI GRASSS HANDY PRODUCT..PLEASE HELP ME..
rajib basu chowdhury: On 27 March 2016 Dear Sir, My company was newly started Export Business. The product is leather dyes . Now i want know the procedure for close the Drawback in DGFT. please find below queries are: 1) if Shipping bill / EP Copy mentioned draw back rate. then which procedure i will follow. 2) which documents are required to submitted to DGFT. please i suggest me how can i do this is to be earlier..
rajib basu chowdhury: On 27 March 2016 dear sir , my company was first time EXPORT.my export material is leather dye's.my export material was going fcl by sea .in this time l will send post documents.my quction is -1.what is post document &how to send the document to buyer. Charan vernekar : On 28 March 2016 I am interested to start cardamom and coffee export business so please guide me how to get license and provide importer detail. Shailesh P. Agarwal : On 18 April 2016 I need your help regarding import documentation. We are importing from Korea under CEPA Can be there are 2 invoices in a CEPA? Murugesan Mahesh : On 18 April 2016 My name is Mahesh working in a private company I am planning to start my own business. I am interested in export business. I dont know how to start my business. Pls guide me. Daniel Josing : On 18 April 2016 I am SIJO JOSING. I have done my MBA ( PORT & SHIPPING) from UPES, Dehradun, U.K. I would like to have book from you about import and export. I wish to start a Import Export Business but I do not have enough knowledge. I have worked in NYK Line in two departments in CSU and Documentation. Even then I feel I do not know about import and export. Flow chart's would be useful. I request you to send the Book and I am willing to pay you for the material as it is difficult for me to access internet at regular basis. Kindly accept my request. I am in desperate need for help. Shanku Dutta: On 18 April 2016 1) I would like to export business from india ( Scrap Items HMS 1 & 2 80 -20 ). So Financial Problem what terms and condition agree by Bank ? 2) Document Procedure I am waiting for reply. Naveed Ahmed: On 18 April 2016 my name is Naveed and I am based in Bangalore. I want to set up a small scale import and export company, where in we would be exporting and importing from Tuticorin Port (India) to Male Port (Maldives) to start off. Hence need your guidance with regards to understanding complete documents including Custom clearance docs required to export and import of goods and the cost involved like Shipping tariff, Tax, Insurance, Custom and other charges. afaqmir: On 18 April 2016 I am importing mobiles from a mobile company called daily deal electronics located at texas , i have made the payments for my package which got dispatched on 14/03/16 and on 17/03/16 it is showing on hold by custums in kazakhstan and after that i made a payment of 20000rs and 8200 rs as a clearence fee but now again the electronic company man is saying to pay 14900 rs as a carrier and clearence fee and he is saying that delivery company is asking for this payment, what should i do sir , shoul i make the payment again , i fear that i may get duped by them , please help . rehana: On 22 April 2016 Hello, I am Rehana Begum, Basically I am a housewife. I want to supply vests to other countries by locally procuring in India. I want to know the procedure and documents required to do such business. Please enlighten me with the process. Thank you. Ramhari Narwade: On 08 May 2016 Dear Sir, I want to export agriculture seeds & grain. kindly suggest the procedure & documentation for same. Kaliyan Singh: On 18 May 2016 hello sir,i want to known export documentation processes.please explain all about export documentation. Dr Hussaini I brahim Agaie: On 29 May 2016 Thank you very much, it is well detailed for the beginners like us.I hope to be receiving the lectuers through my email address, Thank you. Hukam chand nagar: On 04 July 2016 Sir, U want to export exellent quality of garlic, what is procedure and how can I get orders from abroad. Pramod Kumar Bhagat: On 21 July 2016 I want export of singing bowl(antique)I am also deal in india. Need help. Hitesh Gori: On 10 August 2016 I Hitesh Gori, 37 years old, stay at Mumbai.At present i am working at custom house agent. I see your website and it is very useful me and people's who have interested in export and import. I am planning to start export business with small investment and i selected spices and ready-made garment (ladies Kurtis). So, please give me details of export agents for such products. Abhay Agrawal: On 11 August 2016 I would like to introduce myself as Abhay Agrawal aged 44 years from Indore. I came to know that my product being regularly exported I do not have knowledge of from India but since Import Export rules. Ms. Nithya : On 11 August 2016 I m interested in starting Export business & i attend export import courses & analysis so far people are there & trying to help but i really don't why? i am not getting single export orders to get started ...so can u help me ...i don't have any website or any source which i can invest earlier. Naseem: On 11 August 2016 I am Naseem from moradabad and my company name. indian art and handicrafts. Sir i want to know about export. How to start export .and search the buyer? Nitin Sheth: On 11 August 2016 My Name is Nitin Sheth, i am Merchant Exporter and i have some questions. If i am doing Third Party Export, Means puchase from china and Ship to any other country Except india. So which kind of Documentation i have to submit into bank. Is it compalsary that i inform to bank that it is merchant Export and I have to hold USD or USD fund into account until for payment again purchase. Please guide. Naresh Solanki : On 12 August 2016 I am Graduate in Commerce and a Master Degree holder, I am a contractor in Indian Defense at Gujarat Ports. I want to expand my business in a various field like Import and Export, so i need how to start and whats the process regarding that field. M.NATARJAN: On 13 August 2016 My name is natarajan from erode in tamilnadu. Sir I will start new export import business. please guide and tips business. sandarsh suresh : On 17 August 2016 My name is Sandarsh Suresh based out from Bangalore. I went through the website of yours with regards to the procedure of Import/Export. If its convenient. I'm currently working on setting up a I/E firm. Your guidance would be of great use. Archana: On 30 August 2016 I am having two proprietorship concern - one is a SSI unit engaged in the manufacturing which is under central excise and other is trading unit where I import certain items and sale in India and to neighbouring countries after repacking. Trading unit is not registered with central excise.I have IEC code . IEC code is common for both the concern being proprietorship concern. IEC is in the name of trading unit and has endorsement of manufacturing concern as its branch. Recently, we have to export a small consignment through Air Cargo for which one is required to get registration done at air port custom for export. Airport custom refused to carry out registration in the name of SSI manufacturing concern saying it can only be done whose name appears first in IEC certificate which happens to be a trading firm. We have already moved the goods to Mumbai for export after completing excise formalities. In all fairness airport custom should register my manufacturing firm too so that export consignment already moved from manufacturing concern to Mumbai can be exported through air cargo. We have also received payment in the bank account of my manufacturing concern. I am at loss to understand as to what should be done now at this stage so that export takes place. I invite solution to my problem. Thanks. RAJEEV KUMAR VERMA: On 13 September 2016 sir, i wish to export CARPET OR TEXTILE ITEMS, how to search buyers/getting orders. pls help me. suman chakraborty: On 13 October 2016 dear sir I suman Chakraborty from kolkata want to start export hair ,so plz help me how to get byer and as well as how to make my export document. plz help. Shubham Singh: On 05 November 2016 Dear sir. I want to say that please mention all over export documentation sadulles. So we have learned easily. Thanks. Shubham Singh. Abhijit Dhada : On 19 November 2016 I am Abhijit Dhada, working as Senior Manager – IT with SRF Limited. I work with my exports team for IT application development needs. I have a query that “which Branch Code should be printed on the export invoice along with IE Code– the factory branch code from where the material is shipped or the corporate office branch code from where all the documentations are handled.” I searched into various sources but could not get a satisfactory answer hence thought of writing to you. I normally refer to your website regarding any query on import-export and I find the same very informative and quite helpful. acob Kramer : On 19 November 2016 My name is Jacob from Swiss Watch connection. I am interested in exporting watches from India and receiving a refund of the VAT. Rishi Anandan : On 20 November 2016 My name is Rishi. I am running Beta Exports. I just completed my B.E last year and planned to do exports. I also subscribed in a few B2B websites. Now i feel like there is no grip in the business,I don't know where i am going wrong or what should I do to run this business successfully. Please help me and suggest what should to make me an efficient Exporter. Thanking You. Bhavin kubadia : On 22 November 2016 I am small exporter, I cannot send through big shipments as I am sending in small quantity like 15-20kg through courier, is sending through courier is valid & if not how can send small quantity which reach destination in less time & costs less & through legal mode? ramjan: On 29 December 2016 how to get import and export licence .what is the process about this licence ..? Damian: On 19 February 2017 I just stumble into this great article in my search on how to get it right with export. I have not done business before but here I am now wants to try my hands in international business. I have export licence and a company for export from Nigeria, but my major hurdle is how to locate buyers abroad.Our products are ginger, garlic, cassava, yam and palm oil. Thanks. Akshay kumar : On 03 April 2017 Sir ,I want to establish a rice industry in Jharkhand but I have no much idea about it. So I want your help In this subject..
: Nazia.ns Naz : On 08 April 2017 I am an export officer in a pharmaceutical firm and i need your help for the following procedures: 1. How is possible to find out the importers for export our products in Asean countries? 2. and how can we find out the rate i.e FOB, CIF, C&F for our product which we want to export to Asean countries? Your prompt reply is awaited. Thanks. manavalan govindaraj : On 10 April 2017 Dear sir, I am G. Manavalan, an engineering graduate i am very much interest in export & import business. Please guide me for the export & import business. Sharad Lahoti : On 24 April 2017 we need some guidance in the export process like compliance, customs, payments etc. We hope you would provide us some help wrt to these. Pls let me know any suitable time when we can reach out to you (preferably in person) to ask our doubts/question and discuss the idea in bit more detail. Ameer Khan : On 24 April 2017 I'm Ameer from TVM my intention is writes you to learn something about export business of Granite and obtain more orders from aliens I was using search engine for profound comprehend of it then I spotted inductive site of you and your proficiency upon it so me and my colleague concerted write you to inquire and how can you assist concerning this matters which I arose. Jaydada International : On 25 April 2017 My self proprietor of Jaydada international an export firm. sir i have just established it.sir kindly i want to know about that is it compulsory to do a service tax registration for agriculture products exporters? Suman Khatick: On 17 May 2017 Hello sir, I want to start fish export business, I have importers list, but I m not sure of their trustworthiness also as I will be doing this business for the first time I don't have any knowledge on how to export fish, also what legal procedures should I follow, what would be the best and reasonable way to export, also guide me on the precautions should I take. Arjun kumar: On 11 June 2017 , I have just recently joined a company of the export import as a asst merchandiser post in the company. Fresh Sir, I do not have much information about export import. Please I do not know a job profile of Merchandiser, so please tell me can explain in details. Rananjay Singh : On 11 June 2017 I have seen your profile in website actually am working in UAE Past 7 years itelf as a oil gas consultant with ADMA . I have my established spices unit in Bhopal Maddy Pradesh. and daily basis my production 3MT different spices like Turmeric power ,Chile power and coriander powder which is i am supplying in mp state only. I would like to request you please provide your assistance how to export the spices from Bhopal to UAE and what is the requirements of documents. Arup Das : On 11 June 2017 This is to request you for your advice on the feasibility of a particular procedure. We are planning to start rice export to some African nations. Instead of selling it to buyer from India, we want to take our goods to the destination port and sell goods (without customs duty) to the buyers. In such scenario, what would be the actual procedure and documentations. Kindly suggest. Vaibhav Nichal : On 12 June 2017 i had came across your artical a month ago.and i am interested in exporting.i am producer of best quality of AJWAN and want to export it so please help me out for that. i have no idea about exporting. Lakshmi N : On 12 June 2017 I happened to come across your website while searching for information on export business. I have put in quite a number of years in Banking which gives me an edge to understand certain areas related to export import business. It is with this background i am looking forward to start an export business with advise from professional consultants. Pl let me know your convenience. Rajib Burman : On 13 June 2017 I went Start Export Import Between India and Bangladesh from Petrapole/Benapole Land Boarder. But i totally unknown about document and procedure . I also unknown about which type of Financial assistance provide by government. Benson P Chacko: On 13 June 2017 This is Benson, Director of N.S Plastics from Hyderabad. NS plastic is a manufacturing unit where we manufacture all kind of moulded plastics and Metallising(plating) of Gold and silver on plastic products. As of now we are specially dealing with Plastic Curtain rings with gold and silver colour, Different types of trophys, Fan products etc. To expand our business internationally We want to export our products, so help me in this regard. Beena Wankar: On 13 June 2017 I came across your website while researching information on setting up a small business for Retail Exports. You have such a fantastic website detailing the entire process so well. Very impressive. Congratulations. And you share all this information for Free. It is very generous of you. Thank you. I want to start a small Retail export business targeted towards retail customers across the globe. My products would be small items, cables and audio equipment parts, maybe apparel etc later. However after reading about the export documentation required for each export shipment and the costs involved if sent by courier that will bump up the price we can charge, thereby making us less competitive and the process very cumbersome and prohibitive. Additionally the paradigm is different when dealing with Retail customers. There would be no PO, no proforma, payment would be by Paypal or credit cards.. It would simply be something like a mail exchange where someone expresses an interest in purchasing an item from my website, followed by a payment and then a shipment of the item to the person. Deepak Badwal: On 13 June 2017 I am starting now goat meat export for Dubai so I had checked your website how to export I learned everything it's so useful and now I am confident to starting so sir all licence I have but only I need one thing which are the final documents for goat meat because I don't want any hassle and if you will provide any samples of documents than thanks for your highly cooperation I hope as soon as you will be reply me. parveen shaikh : On 14 June 2017 I was going through your site. Many thanks for having such valuable information for people like me who want to start up. There's a mention that there are export agents who help us in all the export formalities on our behalf. Can you please help me with any such references? What is the best way to find buyers for the export? Taha Hussain : On 15 July 2017 I am mahaveer from chennai and was going through your website regarding export procedure from India. A big thanks for the excellent material put forward by you regarding the export and import procedures in India. I have a typical case on hand regarding export and I seek your expert guidance regarding this. I have a US based customer who has agreed to purchase a product I deal in. However, I myself procure that product from china and Hongkong. Is there a possibility to procure the product from China and export to US directly. I can pay the purchase cost to my chinese supplier from India and receive the sale invoice value for this from my American customer. Is such type of export permitted from India ? will I face any problems with the money sent overseas for procuring goods and money received from a different country for the sale. also, since the product will be directly exported to America from China, there will be no customs clearance involved from India. In such a scenario, how can I invoice the US customer and receive the money for the goods supplied. Lakshmi N : On 15 July 2017 I happened to come across your website while searching for information on export business. I have put in quite a number of years in Banking which gives me an edge to understand certain areas related to export import business. It is with this background i am looking forward to start an export business with advise from professional consultants. Pl let me know your convenience. Duleep Regmi : On 15 July 2017 My name is Duleep Regmi based in Mumbai. I have some queries regarding import export business. As I am new to this territory I am trying to get some knowledge from experts like you. I want to import "Achar" (picke) from Kathmandu, Nepal to Mumbai. What is the procedure and documents needed for the same. I will be grateful to you if you could help me out to set up the business. Milan Kanzariya: On 15 July 2017 We can give big order of rice. so you can suggest what is Document required for rice export?, we can deal first time in south Africa. Thanks hoping early reply? Rananjay Singh : On 17 July 2017 I have my established spices unit in Bhopal Maddy Pradesh. and daily basis my production 3MT different spices like Turmeric power ,Chile power and coriander powder which is i am supplying in mp state only. I would like to request you please provide your assistance how to export the spices from Bhopal to UAE and what is the requirements of documents. Aju Menon : On 17 July 2017 I am Aju Menon , from cochin Kerala working as commercial officer -export in fabrics manufacturing company . I would like to start a business in vegetable , cereals , garment export Import industry . In the beginning stage I am planing to work as a Export agent/broker .so pls advise me , what kind of licenses are required . phantuyetngan: On 17 July 2017 My name is Ngan from Viet Nam. Through of some trade website, I can contact with some clients in India and they want to import fresh meat from Viet Nam. Can you help me about details of document, standards and certificates that we have to prepare for can meet all demands of your country. Pradyumn Vijay : On 17 July 2017 I have got IEC now and open ed a bank account to get payment.Now my concern is to know further complete procedure to know how to export goods, documents , I mean complete process. Saifullah Shamsi : On 18 July 2017 We have pleasure to inform you that. We form leather India kanpur. We are trader so We looking for export beef salted omasum for china .So we also get approval form apeda because we are trader so I don't think any unit any packing unit needed if any role play by apeda for traders for taken approval what document needed for export and what other process needed for trader for export. SOLELTHERM TECHNIK : On 18 July 2017 We are a rooftop solar system integration engineering firm based from Bangalore. We are currently seeing certain opportunity in export market - both goods (initially) and services. We are a new firm and have no experience in export of goods and services. Hence we would be seeking for some expert in this field who would undertake all export clearances with respect to Indian Export legalities and procedures and commercial aspects. Would like to discuss with you in this matter. Please let me know your concurrence in this matter and waiting for your response to discuss ahead. Arvind: On 08 August 2017 hello sir,i want to known export documentation processes.please explain all about export documentation. Manoj Kumar: On 05 October 2017 EXPORT DOCUMENTATION AND PROCEDURES	Exporters should seriously consider having the freight forwarder handle the formidable amount of documentation that exporting requires; freight forwarders are specialists in this process. The following documents are commonly used in exporting; which of them are actually used in each case depends on the requirements of both our government and the government of the importing country. 1. Commercial invoice 2. Bill of lading 3. Consular invoice 4. Certificate of origin 5. Inspection certification 6. Dock receipt and warehouse receipt 7. Destination control statement 8. Insurance certificate 9. Export license 10. Export packing list STEP1: Enquiry : The starting point for any Export Transaction is an enquiry. An enquiry for product should, inter alia, specify the following details or provide the following data Size details - Std. or oversize or undersize Drawing, if available Sample, if possible Quantity required Delivery schedule Is the price required on FOB or C& F or CIF basis Mode of Dispatch - Sea, air or Sea/air Mode of Packing Terms of Payment that would be acceptable to the Buyer - If the buyer proposes to open any Letter of Credit, any specific requirement to be complied with by the Exporter Is there any requirement of Pre-shipment inspection and if so, by which agency Any Certificate of Origin required - If so, from what agency. STEP 2: - Proforma generation : After studying the enquiry in detail, the exporter - be it Manufacturer Exporter or Merchant Exporter - will provide a Proforma Invoice to the Buyer. STEP 3: Order placement : If the offer is acceptable to the Buyer in terms of price, delivery and payment terms, the Buyer will then place an order on the Exporter, giving as much data as possible in terms of specifications, Part No. Quantity etc. (No standard format is required for such a purchase order) STEP 4: Order acceptance : It is advisable that the Exporter immediately acknowledges receipt of the order, giving a schedule for the delivery committed. STEP 5: Goods readiness & documentation : Once the goods are ready duly packed in Export worthy cases/cartons (depending upon the mode of despatch), the Invoice is prepared by the Exporter. If the number of packages is more than one, a packing list is a must. Even If the goods to be exported are excisable, no excise duty need be charged at the time of Export, as export goods are exempt from Central Excise, but the AR4 procedure is to be followed for claiming such an exemption. Similarly, no Sales Tax also is payable for export of goods. STEP 6: Goods removal from works : There are different procedures for removing Export consignments to the Port, following the AR4 procedure, but it would be advisable to get the consignment sealed by the Central Excise authorities at the factory premises itself, so that open inspection by Customs authorities at the Port can be avoided. If export consignments are removed from the factory of manufacture, following the AR4 procedure, claiming exemption of excise duty, there is an obligation cast on the exporter to provide proof of export to the Central Excise authorities STEP 7: Documents for C & F agent : The Exporter is expected to provide the following documents to the Clearing & Forwarding Agents, who are entrusted with the task of shipping the consignments, either by air or by sea. Invoice Packing List Declaration in Form SDF (to meet the requirements as per FERA) in duplicate. AR4 - first and the second copy Any other declarations, as required by Customs On account of the introduction of Electronic Data Interchange (EDI) system for processing shipping bills electronically at most of the locations - both for air or sea consignments - the C&F Agents are required to file with Customs the shipping documents, through a particular format, which will vary depending on the nature of the shipment. Broad categories of export shipments are: Under claim of Drawback of duty Without claim of Drawback Export by a 100% EOU Under DEPB Scheme STEP 8: Customs Clearance : After assessment of the shipping bill and examination of the cargo by Customs (where required), the export consignments are permitted by Customs for ultimate Export. This is what the concerned Customs officials call the ‘LET EXPORT’ endorsement on the shipping bill. STEP 9: Document Forwarding : After completing the shipment formalities, the C & F Agents are expected to forward to the Exporter the following documents: Customs signed Export Invoice & Packing List Duplicate of Form SDF Exchange control copy of the Shipping Bill, processed electronically AR4 (original duplicate) duly endorsed by Customs for having effected the Export Bill of Lading or Airway bill, as the case may be. STEP 10: Bills negotiation : With these authenticated shipping documents, the Exporter will have to negotiate the relevant export bill through authorized dealers of Reserve Bank, viz., Banks. Under the Generalized System of Preference, imports from developing countries enjoy certain duty concessions, for which the exporters in the developing countries are expected to furnish the GSP Certificate of Origin to the Bankers, along with other shipping documents. Broadly, payment terms can be: DP Terms DA Terms Letter of Credit, payable at sight or payable at... days. Step11: Bank to bank documents forwarding : The negotiating Bank will scrutinize the shipping documents and forward them to the Banker of the importer, to enable him clear the consignment. It is expected of such authorized dealers of Reserve Bank to ensure receipt of export proceeds, which factor has to be intimated to the Reserve Bank by means of periodical Returns. STEP 12: Customs obligation discharge : As indicated above, Exporters are also expected to provide proof of export to the Central Excise authorities, on the basis of the Customs endorsements made on the reverse of AR4s and get their obligation, on this score, discharged. STEP 13: Receipt of Bank certificate : Authorized dealers will issue Bank Certificates to the exporter, once the payment is received and only with the issuance of the Bank Certificate, the export transaction becomes complete. It is mandatory on the part of the Exporters to negotiate the shipping documents only through authorized dealers of Reserve Bank, as only through such a system Reserve Bank can ensure receipt of export proceeds for goods shipped out of this country. SURYANSH GARG: On 15 October 2017 i want to start an overseas pharmaceutical business. Kindly help in the learning of procedures. Subhendu Ghosh : On 14 March 2018 Want to start export import business for this i need training from your end , kindly let me know how can i get this ? sunil mishra : On 14 March 2018 Sir i want to import ldpe film scrap from turkey to india is there any problem regarding this? Or how to receive consignment at indian port?? Jasbir Singh : On 14 March 2018 My name is Jasbir Singh from Amritsar. We import goods from China since 4 years. Now we want to import from China and export to 3rd Country New York USA. So I want to know about this is possible to import from China in 1st company and export to NY USA in 2nd company without paying any tax. Omkar Singh : On 14 March 2018 I want to start Export Business From India to other country . Is people involve in this type business ,People will success or failure . .Please send your contact No for discussion to start Export Business Fro India to other country . Rajesh R: On 29 May 2018 i have IEC from dgft. Do i also need membership of export promotion councils to export ? Because i want to spend membership fees which is very high with EPC for which they donot provide any services worth. i want to stop my membership from this year. if so can will i be banned to export ? raj dubey: On 10 January 2019 I want to export herbal products pls guide me …..